Search, compare and book for Campervan Hire on the Gold Coast. We Guarantee the Best Rental Prices in Queensland - if you find cheaper, let us know! Campervan & 4WD Rental Gold Coast from $29 Per Day! Looking to Hire a Campervan on the Gold Coast? Southport, at the northern end of the Gold Coast hasn’t changed since the 80’s and is still littered with dodgy business men in cheap Hawaiian shirts. Five minutes further south, and it doesn’t get much classier. Surfers Paradise is a nightclub strip right on the beach, which relishes in its own tackiness. Nowhere else in Australia will you see more fake breasts, fake tan, messed-up teenagers and freakish levels of testosterone. It might be good for a night out, but don’t hang around – there’s way better stuff further south. Heading south along the Gold Coast highway, there’s plenty of beachside campervan-friendly caravan parks in Miami, Burleigh Heads and Tallebudgera. These parks get busy over summer, so keep a Plan B in mind if travelling with the wind. Burleigh Heads and Tallebudgera Creek are natural wonders, well worth checking out – particularly if you’re looking for surf. The towns further south, Palm Beach, Currumbin, Tugun and Coolangatta are all quiet, humble working-class beach suburbs. 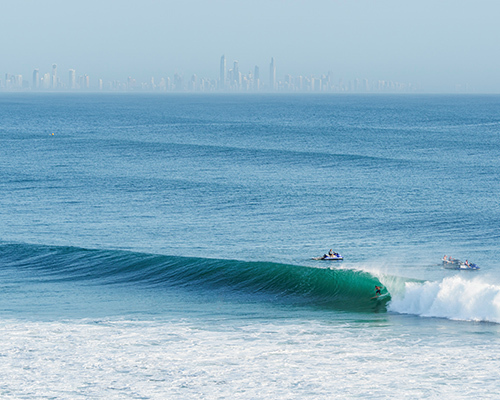 Coolangatta, of course, is home to some of the world’s most famous waves – Kirra point, Snapper Rocks and Duranbah. As far as pubs go, the Gold Coast is distinctly lacking in good places to go out at night. Since driving conditions in the outback vary greatly, you should always consider the right campervan hire Gold Coast for your travel. Campervan rental are the best when it comes to exploring Gold Coast. Check out our best pricing and book your travel with us. We provide the best Gold Coast hire pricing in Gold Coast for budget backpackers in Australia. 100-170kms south of Brisbane along the Pacific Highway. Hire a Campervan on the Gold Coast from $29 Per Day and explore Australia's beautiful East Coast!